June 6: An assembly was held to discuss prison projects and recent struggles of revolutionary prisoners and prison rebels. June 8: A card and letter writing night for anarchist prisoners was held. A few letters were written and cards were signed for 20 anarchist prisoners in the United States. June 9: The Pages to Prisoners Project held a 12-hour ‘packathon’ event where people responded to prisoners’ letters and put together packages of books. June 10: A film showing of Lucio, a documentary about anarchist counterfeiter Lucio Urtubia. June 11: A microphone demonstration was held at the town square with a dozen comrades handing out literature and holding banners. A sound system played Sean Swain’s 2015 June 11th statement, an interview with Michael Kimble, and interviews about June 11th and Sean’s recent struggles. 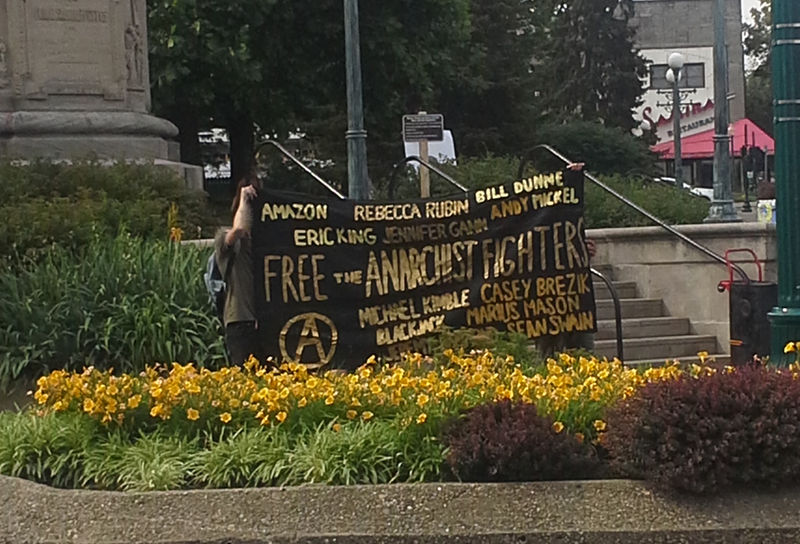 Banners included “Free Marius Mason and All Prisoners” and “Free the Anarchist Fighters” with the names of long-term anarchist prisoners in the United States (Amazon, Bill Dunne, Rebecca Rubin, Jeremy Hammond, Jennifer Gann, Andrew Mickel, Blackjack, Michael Kimble, Sean Swain, Casey Brezik, and Marius Mason) and one awaiting trial (Eric King). These are all small gestures for our imprisoned comrades, gestures we hope can help break down the isolation imposed by prison. Raising funds, sending letters and books, and raising awareness about prisoners are all important. However, we must recognize them as parts of a polymorphous and combative struggle against prison society as a whole. The recent hunger strike of Greek anarchist and rebel prisoners, the successful hunger strike of Nikos Romanos, the refusal of Spanish anarchists to break beneath the weight of Operation Pandora and Operation Piñata, the wide array of attacks in solidarity with prisoners and against repression: these all offer glimpses of possibilities, of freedom and rebellion. We send international greetings to Nataly, Juan, and Guillermo, anarchist prisoners in Chile who recently ended their hunger strike after 53 days; those facing repression in Operation Piñata and Operation Fenix; Chilean anarchist Tamara Sol, recently moved a high security prison; Silvia, Billy, and Costa, facing charges yet again for an alleged plan to sabotage an IBM nanotechnology research center, for which they have already served years in prison; and Marco Camenisch, held captive since 1991. We also express our deepest rage at state murder of comrade Spyros Dravilas in Greece. 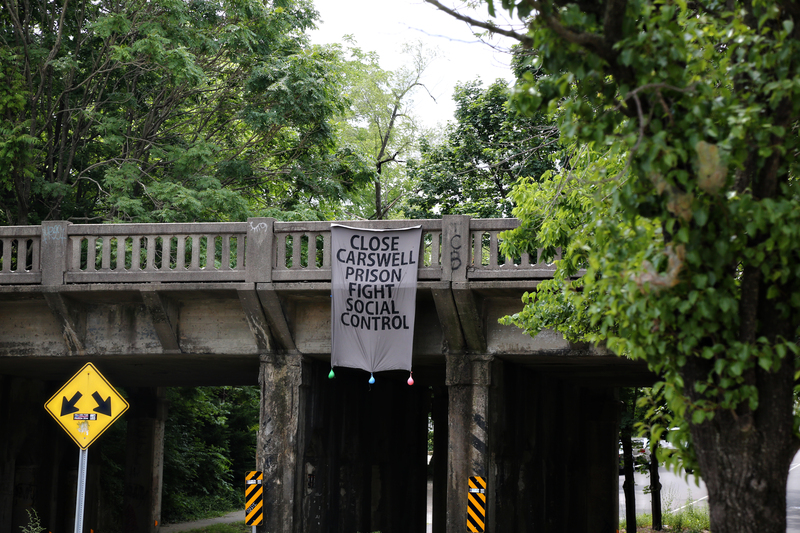 We will not forget that Bloomington was once home to Marius Mason and we will not cease to struggle for his freedom and the freedom of all prisoners. Solidarity with all prison rebels! Solidarity with all anarchist prisoners! Solidarity with the fugitives running wild and free! June 12- We attacked the facade of the AT&T building in Bloomington with paintbombs. The company’s cooperation with NSA surveillance efforts was confirmed again one year ago by the Snowden leaks, yet AT&T and other collaborators have escaped any real consequences. We covered the building with graffiti highlighting their massive participation in the machinery of control and repression. This machinery (digital and physical) is everywhere and available to simple attacks like this one. 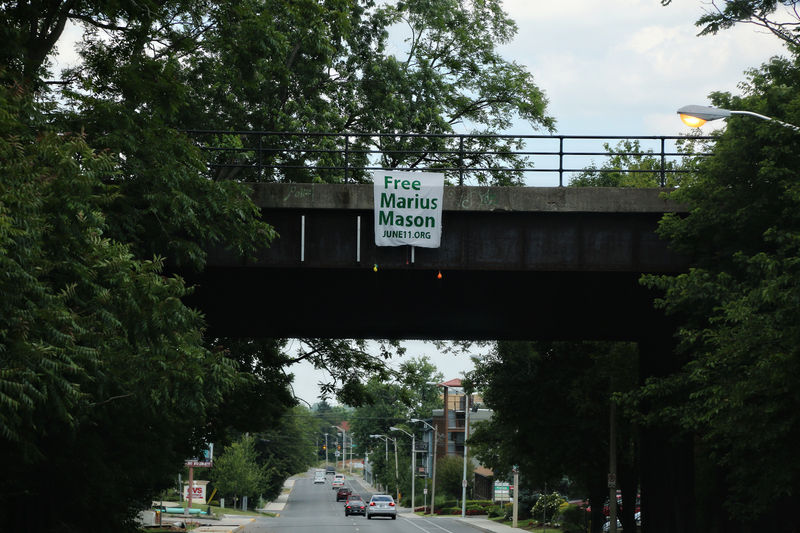 Solidarity with Marie Mason and Eric McDavid in their daily struggles against prison. These revolutionaries are imprisoned for their commitment to struggle in defense of the earth. The same forces that profit from the destruction of the natural world also maintain prisons and require the protection of police and the NSA. Solidarity with Chelsea Manning, Jeremy Hammond, and all rebels whose actions expose and attack the cracks in this control society. 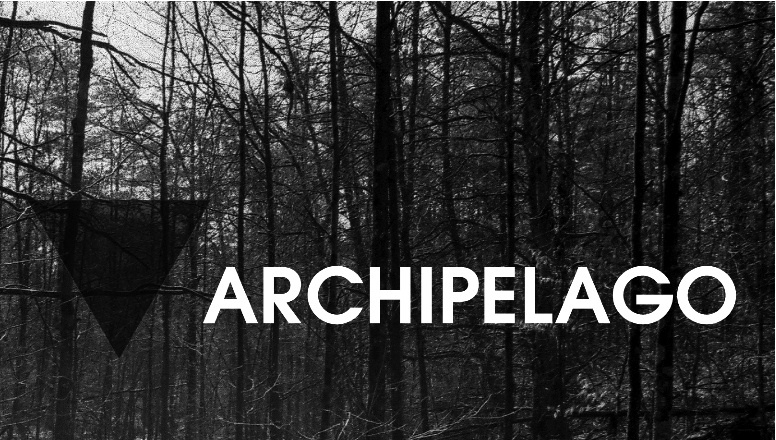 A new midwest (A) Journal: Archipelago Issue 0 Out Now! This spring, as recent waves of revolt began their gradual retreat into our memories, a few of us in the Midwest paused to collect our thoughts and reflect on some of the rupturous moments we’ve experienced over the last six months. Archipelago is but one product of these reflections: a fresh project with a familiar premise. The strong connections that exist through this region aren’t new, nor is the idea of pooling thoughts and analysis in a publication, but it has felt pressing, in this particularly ripe moment, to ensure space for these conversations to mingle and stew with one another. The content of this issue is largely the work of a small group of people in a few cities, however, we’d like to extend an invitation to anyone who is living and struggling here in the nocoast to submit content for future issues. Send us: reportbacks, dialogues, love letters, strategy statements, position papers, communiqués, articles, death threats, hi-res photos, and responses to anything from this issue (because, let’s be real, we KNOW you have feelings about “Don’t Move to the Bay”). 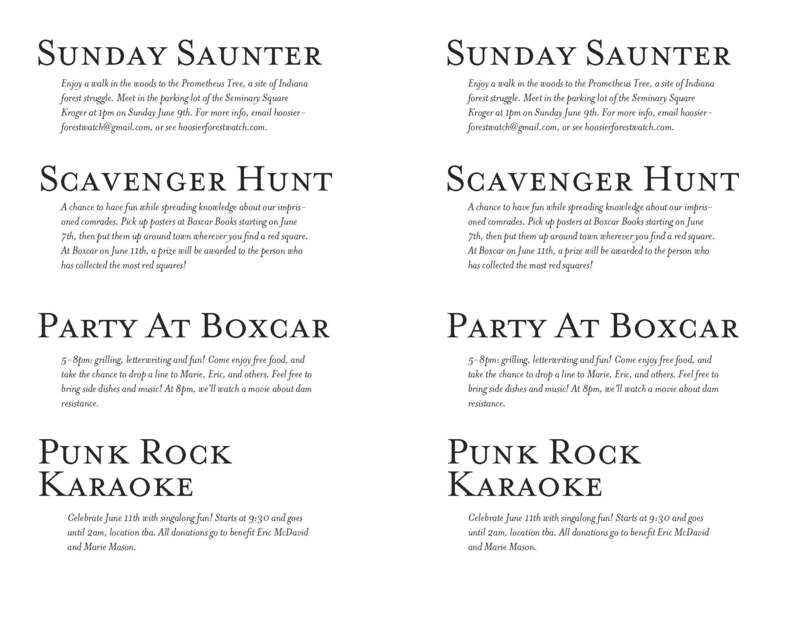 What are you doing after May Day or for June 11th,* or whatever? 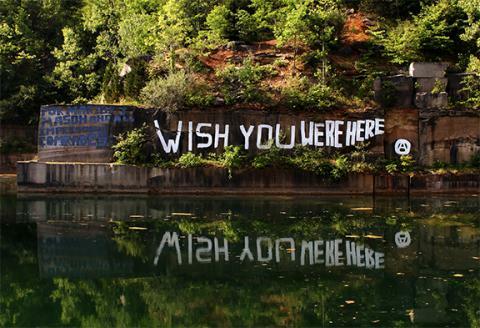 Filed under Analysis and tagged analysis, Art, books, crisis, june 11th, queer, words |	Comments Off on A new midwest (A) Journal: Archipelago Issue 0 Out Now! 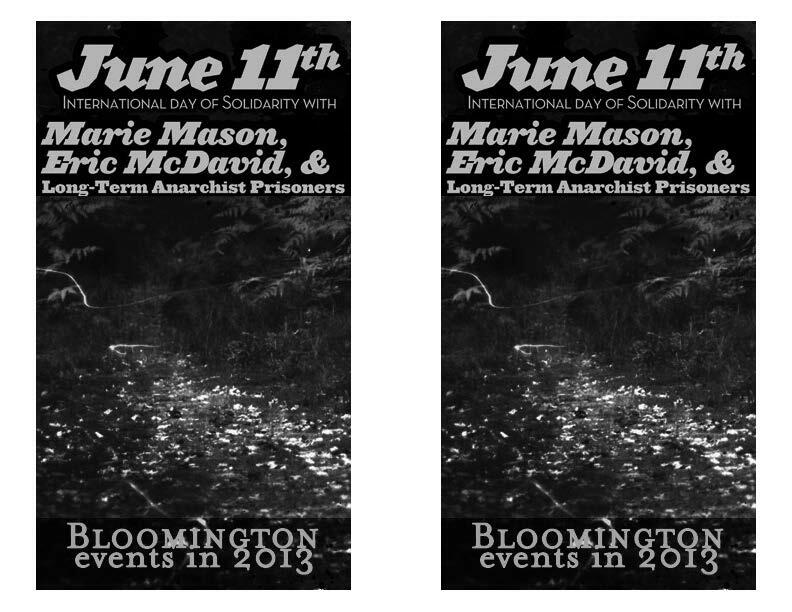 There’s gonna be a super fun BBQ/Block Party here in Bloomington as part of the international day of solidarity with Marie Mason, Eric McDavid and longterm anarchist prisoners. It’s gonna be awesome! Music, hangin’ out, and rumor has it there might even be a piñata… but you didn’t hear it from us. 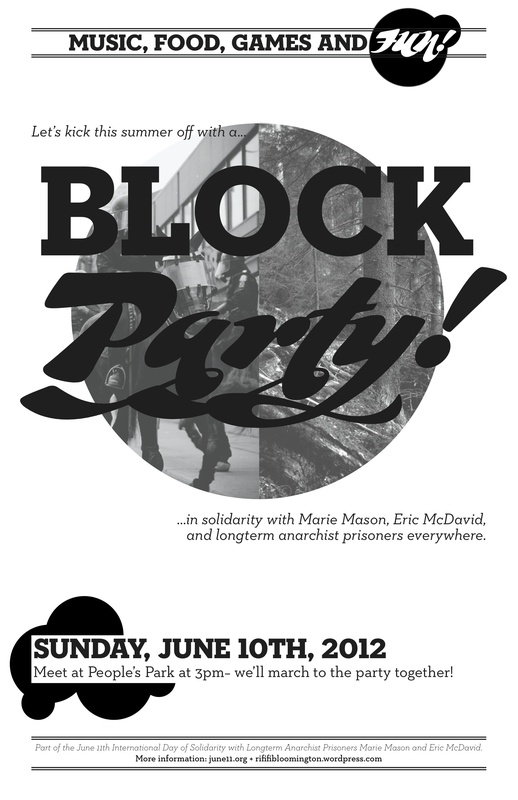 Filed under Event and tagged Bloomington, event, june 11th, prisoners, solidarity, sweet banners, The Party |	Comments Off on BLOCK PARTY! !